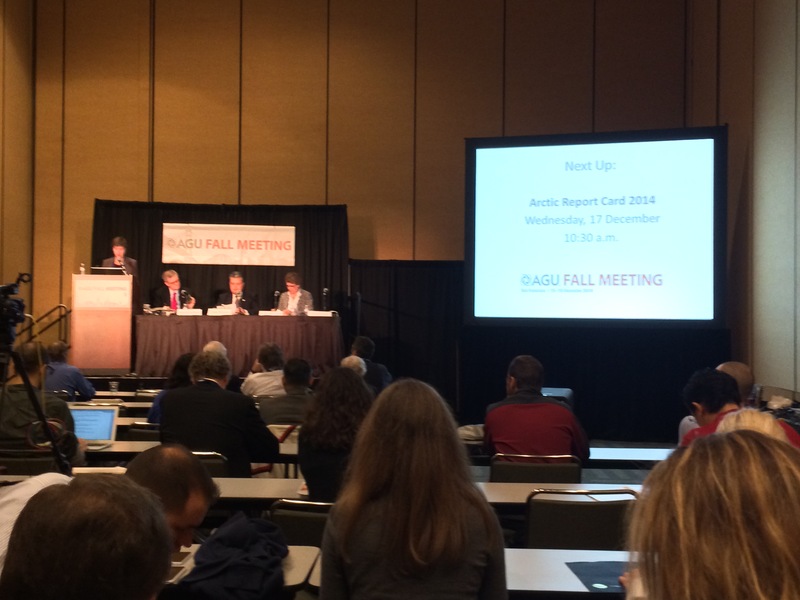 Have I mentioned yet exactly how many people are in attendance at the 2014 AGU Fall Meeting? The statistics have not been finalized yet, but as you can see from the tweet above (poster earlier in the week), we have increased the population of San Francisco by 25,000! The Arctic is warming three times faster than lower latitudes, setting off changes that affect not only the fragile region, its people, wildlife and environment, but also have broader ramifications beyond the Arctic for global security, trade, industry, weather, climate and sea level. Learn the latest observations on air and sea temperatures, snow, sea ice, the Greenland ice sheet, vegetation and wildlife. This year’s report also includes a special update on a signature animal species. Geoff York, Senior Director of Conservation, Polar Bears International, Bozeman, Montana, U.S.A. It was absolutely fascinating to be sitting in the room, listening to the scientists report their results for the first time to a public audience – this time, the audience being the press. The Arctic Report Card 2014 went “live” during the press briefing, and below I’ve included a video summary of what it contains. The items I took away from the briefing were that (a) people need to understand that the United States is an Arctic nation; (b) we must continue to monitor the cryosphere all year and all of its elements, because it is a complicated system part of a larger system; and (c) if this “report card” had to get a grade, it would receive an incomplete, because this is a story that needs to be told over the long term. Next up was my time in the AGU Ask an Expert area of the exhibit hall, where anyone could come ask me questions about using social media! It was nice to sit in comfy couches and engage in great conversations with people just getting started in blogging and Twitter. 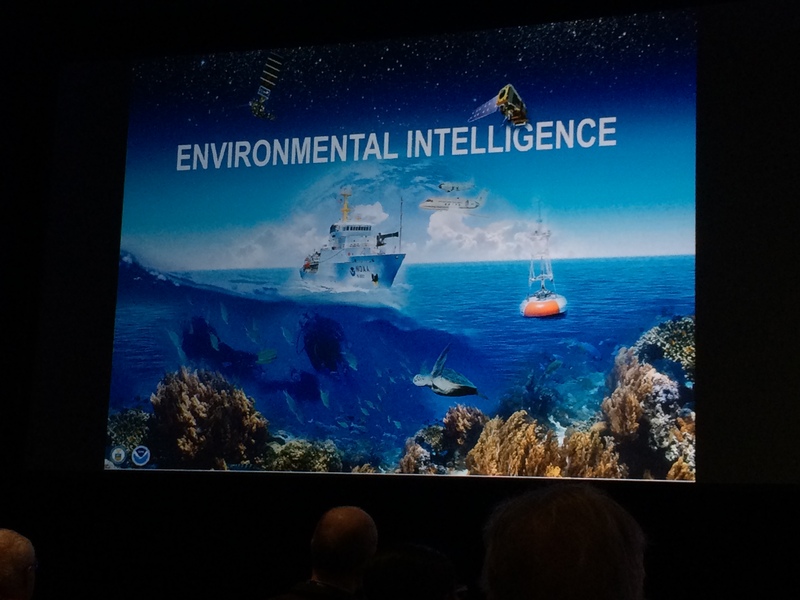 I then zipped over to the lunchtime keynote (or what AGU calls a General Session) to hear Kathryn Sullivan, Under Secretary of Commerce for Oceans and Atmosphere and NOAA Administrator, for a talk about Building Resilient Communities. In addition to learning about a wide range of NOAA-related topics, including the concept that NOAA (that’s the National Oceanic and Atmospheric Administration) is America’s environmental intelligence agency, I was so excited to see the speaker use a graphic that included the ship I just went out to sea on back in September, the NOAA Ship Thomas Jefferson! My student Kimmie and I then dashed across the street, over to one of the other convention center buildings for a session called Is Global Citizen Science the Next Big Science? These talks were absolutely inspiring to hear, and it is amazing what organizations such as Adventurers and Scientists for Conservation can accomplish! We then headed over to the Social Media Forum, where a panel of people that use social media, from government agencies to Mashable, provided advice and strategies for using social media effectively. Communication and outreach rose to the top of the list for reasons to use social media, and although Facebook has three times the traffic of Twitter, all were enthusiastic users of Twitter (much of the science community is on there). 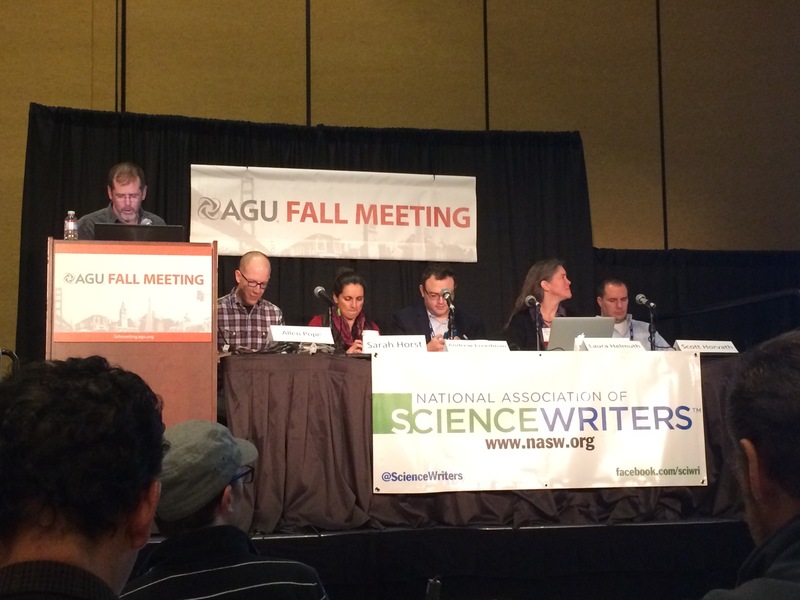 The panel was sponsored by AGU and the National Association of Science Writers (NASW). The final event of me for the night (phew!) was the AGU Honors Ceremony and Banquet. One of my mentors and friends, Dr. Heather Macdonald from the College of William & Mary, received the Excellence in Geophysical Education Award for a sustained commitment to excellence in geophysical education, and for her transformation of the geoscience education landscape through leadership in programs for 2-year college, early career, and future geoscience faculty. I just saw her receive the award, and now, I’m off to the banquet to continue the celebration!